Marygrove representative Mari Carter visited Webster University’s home campus on Tuesday, April 19, seeking students and alumni to join their growing team. Marygrove is one of the largest therapeutic residential treatment programs in Missouri. As part of the on-campus recruiting services offered by Webster's Career Planning and Development Center, Marygrove came to Webster to recruit candidates for full, part-time and on-call positions including immediate openings as residential technicians and recreational summer aids. Marygrove serves as a new beginning for the 150 children and young adults served each day. 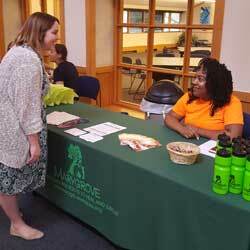 In addition to job opportunities, volunteers are key to the success of Marygrove. “I was so excited to learn about the variety of opportunities Marygrove offers for our students who want to start a career or just give back to those who are most in need," said Trezette Dixon, assistant director, Employer Relations, Career Planning and Development Center. To find out more about the organization, contact, Sharon Richardson, director of human resources, srichardson@mgstl.org or 314-830-6290, visit marygrovechildren.org.